[S1134] Harvard College, Harvard College Class of 1916 Secretary's Third Report, privately printed for the class, June 1922,. [S1612] Andrew, family tree titled "Centre Island, NY", published by Ancestry.com, wc.rootsweb.ancestry.com, from database named vonlork, updated Feb 2011, viewed Feb 2011. [S1302] Connecticut Death Index, 1949-2012, online index database, digitized by Ancestry.com Operations Inc, 2003 www.ancestry.com. (Original publication: Connecticut Department of Health Connecticut Death Index, 1949-2012, Hartford CT: Connecticut Department of Health) viewed Feb 2011. [S1134] Harvard College, Harvard College Class of 1916 Secretary's Third Report, privately printed for the class, June 1922, p 446. Joseph Bradford Sargent was born on 14 Dec 1822, in Leicester, Massachusetts. He married Elizabeth Collier Lewis, daughter of Curtis Lewis and Jane Gardner Collier, on Monday, 17 Jan 1848 in Griffin, Georgia. 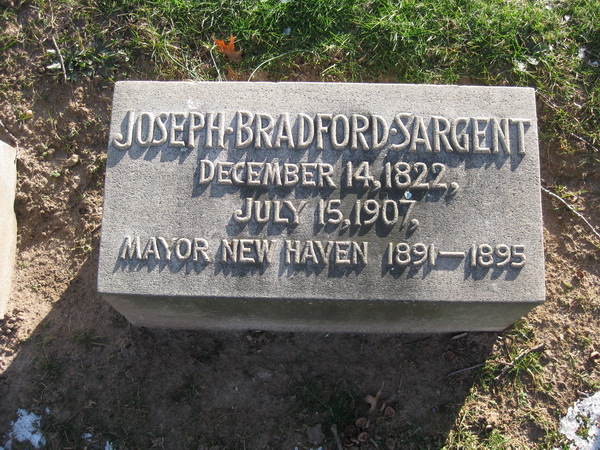 Joseph Bradford Sargent died on 15 Jul 1907 in New Haven, Connecticut, at age 84. An obituary was published in the New York Times, in New York City, New York, on 17 Jul 1907. A notice was published SARGENT-At his home in New Haven, Conn., on Monday, July 15, 1907, Joseph Bradford Sargent, in the 85th year of his age. Private services will be held at his late residence on Wednesday, July 17, at 2:30 P.M. Kindly omit flowers. JBS, wife and daughter moved from Griffin GA to NYC in 1849 living at first in a second storey apartment on Henry St, NW corner of Jefferson. Later they lived with the family of his sister Sophia who was married to William Boggs and had 3 daughters, at 191 E Broadway. Afterwards both families moved to Brooklyn NY and lived together at 168 Washington St.
JBS was in business in NYC at 24 Cliff St 3rd floor, a little tin sign tacked on the door. He sold old fashioned hand cards for himself and also acted as agent for Peck, Walter & Co in Franklin St. New Britain CT, manufacturer of builder's hardward. In 1854 the sign was changed to Sargent Brother & Co. (no Co. but it looked better). In 1854 they moved to 85 Beekman St., and were a selling agent for many concerns. In 1857 they bought out Peck & Walter. They sold many types of hardware paraphernalia. In 1864 they moved the business to New Haven. While selling George travelled in 1854 during Jan and Feb to Louisville, KY, St. Louis, Memphis, New Orleans, Mobile, Montgomery, Atlanta and Washington, all by steamboat and stagecoach. Joseph moved to New Haven, buying his house in 1878. The residence was at 51 Elm St (corner of Church St) in New Haven. The main entrance was on Church. Also on Church St was a garden, green house and stable shut off from view by a high stone wall. It was built in 1822 by Don David Cortiz de Forest. In 1907 it was torn down. The County Court house is at that spot. In 1870 JBS wrote to Mr. George J. Brush the treasurer of Sheffield Scientific School of Yale and paid him $2000 in advance to educate 5 people for 3 years - 4 of his sons who were age 5, 7, 9, and 12. Edward Sargent was once arrested on suspicion of being a horse thief. JBS put responsibility upon his sons at an early age. Ned was about 14, a student at Hopkins Grammar School when his father entrusted him with riding a horse alone from Worcester (or some other distant point) to New Haven. At Hartford, where he stopped for the night, he was arrested by an officer of the law, who thought the boy's story sounded fishy, so held him till it could be checked. JBS was furious, but what he said and what he wrote have not been preserved. At any rate the boy was released and continued his journey... When Elizabeth Collier Lewis Sargent died in 1874 Laura took care of her youngest brother John. Her father married Florence who was only 6 years older than Laura, and one year old than Elizabeth, the eldest daughter. JBS traveled around the world with his wife Florence bringing samples from Sargent & Co. He was an advocate of free trade and in the presidential election in 1884 he left the Republican Party and worked for the election of Grover Cleveland. He attended the 2-day convention in Chicago Nov 15 1885. 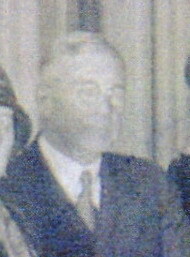 His brother George was working for the election of Blaine, the Republican candidate. He wrote many letters which still remain. In speaking of Joseph, his brother said "His (Joseph) idea was of a purely utilitarian character. He believed that a young man's chances were better in business than in a profession; if very able he might win position and distinction in the law, while in business he would secure an independence financially." JBS was in New Zealand in Jan 1888, Australia in Oct-Nov 1889. Then he expected to go to Java, Burmah-Rangoon and Mandalay 800 miles inland - stay in Mandalay and the nearby jungle a month or two, then to Penang, Singapore, Hong Kong, Shanghai (Apr 1890) then Japan. Home, then possibly to South Africa or South America. [S6064] Samuel F Babbitt, family tree titled "Babbitt/Moore/Sargent/Fisher/Converse Family Tree", published by Ancestry, www.Ancestry.com, from database named 22391445, Hamden, CT,viewed May 2018. [S285] 1930 US Federal Census, New Haven, New Haven County, Connecticut, digital image Ancestry.com ; National Archives micropublication, Florence W Sargent head of household, roll 276, enumeration district 49, page 1A. [S1258] John Alden Brett, editor, 1635-1935 Connecticut Yesterday and Today, Hartford, Connecticut: The John Brett Company, 1935, p 198. [S351] 1900 US Federal Census, New Haven, New Haven County, Connecticut, digital image Ancestry.com ; National Archives micropublication, Joseph B Sargent head of household, roll T623_144, enumeration district 341, page 4B. 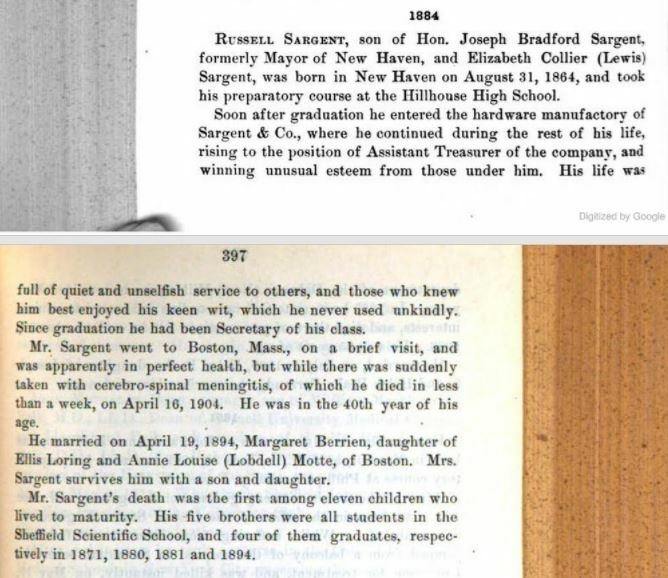 [S29] Aaron Sargent, Sargent Genealogy in England and America, Somerville, MA: privately published, 1895, p 85. 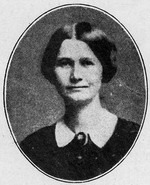 Elizabeth Collier Lewis was born on 14 Jan 1829, in Greensboro, Georgia. She was usually called Lillie. She married Joseph Bradford Sargent, son of Joseph Denny Sargent and Mindwell Jones, on Monday, 17 Jan 1848 in Griffin, Georgia. 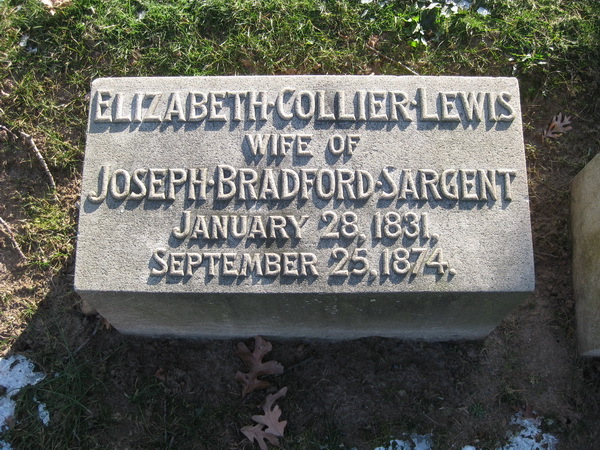 Elizabeth Collier Lewis died on 25 Sep 1874 in New Haven, Connecticut, at age 45. [S6341] Abbeville68, family tree titled "Clark Lewis NorwoodGlover Hill", published by Ancestry, www.ancestry.com, from database named 46023584, viewed Dec 2018. Elizabeth Craft Sargent was born on 7 May 1849, in Griffin, Georgia. Elizabeth Craft Sargent died on 18 Apr 1904 in New Haven, Connecticut, at age 54. [S376] Robert G Lesher, family web site titled "Lesher of Colorado", www.lesher.net/genealogy, uploaded Aug 2007, viewed Aug 2007. [S1535] Hale Cemetery Inscriptions and Newspaper Notices, 1629-1934, online image database transcription, digitized by Ancestry.com Operations Inc., 2012 Ancestry.com . (Original publication: The Charles R Hale Collection Hale Collection of Connecticut Cemetery Inscriptions, Hartford, CT: Connecticut State Library. )Page 215-1 #77 (page 481 on ancestry.com). Henry Bradford Sargent was born on 4 Mar 1851, in New York City, New York. He graduated from Yale Sheffield Scientific School in New Haven, Connecticut, in 1871. He died on 3 Feb 1927 at age 75. [S4089] Winthrop Sargent, Early Sargents of New England, privately printed, 1922, p 22. [S1200] Newspaper, probably New Haven Register, New Haven, CT, obituary notice. [S1143] Yale University, Directory of the Living Non-Graduates of Yale University: Issue of 1914, Yale University, 1914, p 159. Laura Sargent was born on 18 Oct 1854, in Brooklyn, New York. 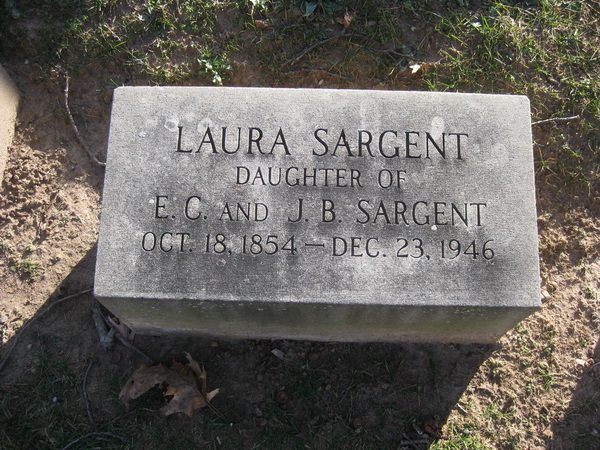 Laura Sargent died on 23 Dec 1946 in New Haven, Connecticut, at age 92. The death of Miss Laura Sargent, 92, daughter of Joseph B. Sargent, founder of the Sargent hardware Company and former mayor of New Haven, occurred yesterday at 1:30 P.M. in her home, 178 Bishop Street. Private funeral services will be held today at 2 in the parlors of Beecher and Bennett. 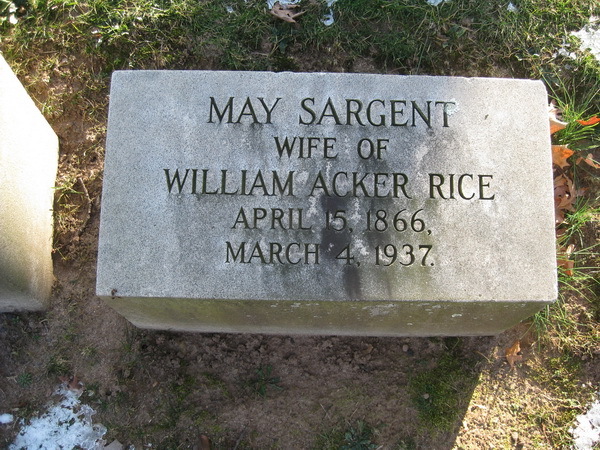 Miss Sargent is survived by a sister, Mrs. Samuel H. Fisher of Litchfield; a brother, John Sargent of Greenwich; and a nephew, William F. Sargent, who made his home with her for the last several years. The thrid of 12 children of the late Joseph Bradford and Elizabeth Collier Sargent, Miss Sargent was born Oct. 18, 1854 in Brooklyn, NY. The family came here when she was ten. 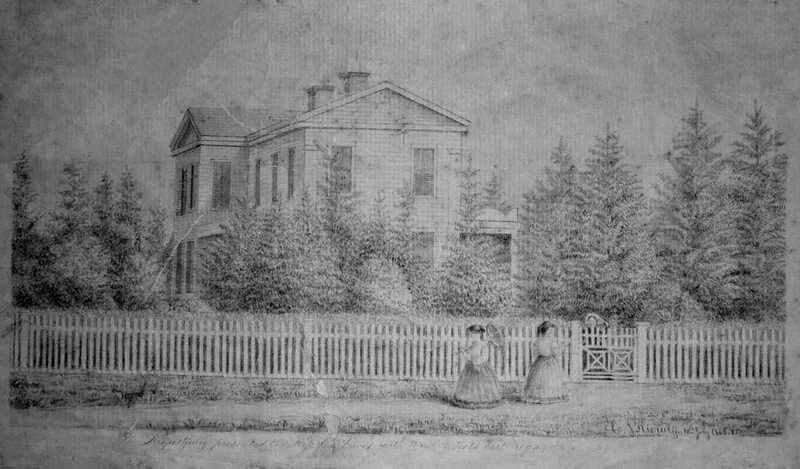 In 1878 the Sargent family lived at the corner of Elm and church Streets, site of the present County Court House. Following the death of her father in 1907, Miss Sargent traveled extensively in Europe, especially in Italy. She had lived in Bishop Street since 1912 when she had the home built. She was an early member of the Saturday Morning club in which she took an active interest, and was for many years secretary. William Boggs Sargent was born on 28 Jan 1857, in New Britain, Connecticut. He died on 24 Jun 1857 in New Britain, Connecticut, at 4 months and 27 days. Edward Rupert Sargent was born on 9 Mar 1858, in New Britain, Connecticut. 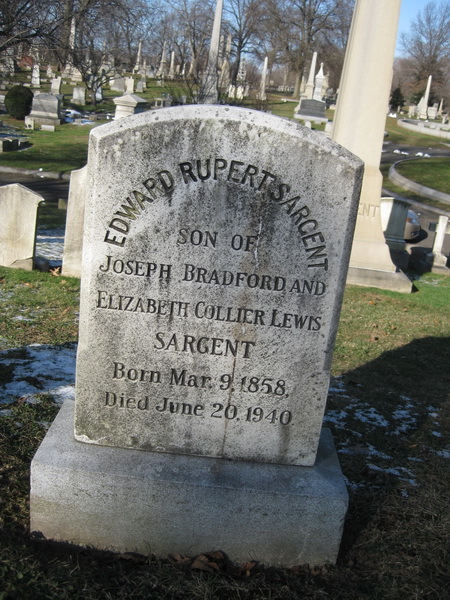 Edward Rupert Sargent died on 20 Jun 1940 at age 82. [S1143] Yale University, Directory of the Living Non-Graduates of Yale University: Issue of 1914, Yale University, 1914, p 158. [S289] 1920 US Federal Census, New Haven, New Haven County, Connecticut, digital image Ancestry.com ; National Archives micropublication, Edwin R Sargent head of household, Ward 8, roll T625_193, enumeration district 351, page 2A. [S280] 1910 US Federal Census, New Haven, New Haven County, Connecticut, digital image Ancestry.com ; National Archives micropublication, Edward R Sargent head of household, Ward 8, Roll T624_139, enumeration district 0407, page 8B. 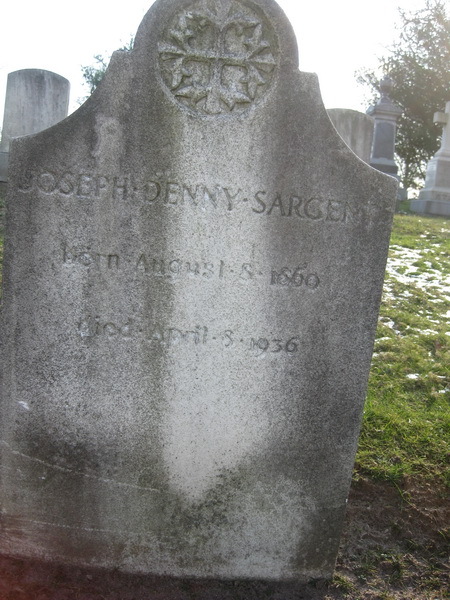 Joseph Denny Sargent was born on 8 Aug 1860, in New Britain, Connecticut. He graduated from Yale Sheffield Scientific School in New Haven, Connecticut, in 1881. He married Clara Louise Weir on Thursday, 8 Oct 1896 in New Haven, Connecticut. 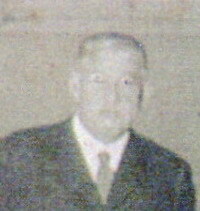 He died on 8 Apr 1936 at age 75. [S285] 1930 US Federal Census, New Haven, New Haven County, Connecticut, digital image Ancestry.com ; National Archives micropublication, Joseph D Sargent head of household, roll 276, enumeration district 53, page 8A. Russell Sargent was born on 31 Aug 1864, in New Haven, Connecticut. He graduated from Yale Sheffield Scientific School in New Haven, Connecticut, in 1884. He married Margaret Berrien Motte, daughter of Ellis Loring Motte and Annie Louise Lobdell, on Thursday, 19 Apr 1894. 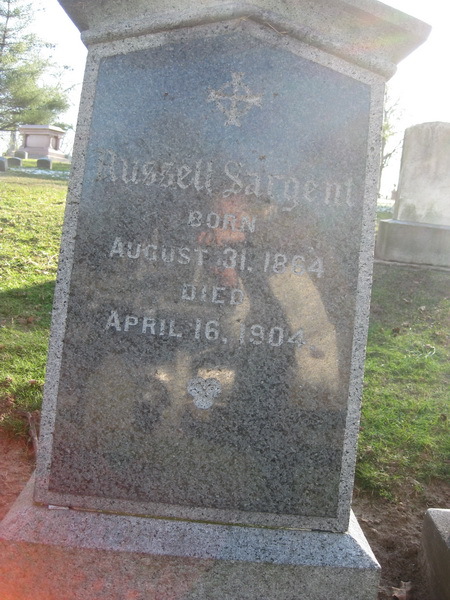 Russell Sargent died on 16 Apr 1904 in Boston, Massachusetts, at age 39. [S351] 1900 US Federal Census, New Haven, New Haven County, Connecticut, digital image Ancestry.com ; National Archives micropublication, Russell Sargent head of household, roll T623_145, enumeration district 373, page 4B. [S5633] Obituary Record of Graduates of Yale University Deceased from June, 1900, to June 1910, The Tuttle, Morehouse & Taylor Co, New Haven CT, 1910 etc, Presented at the annual meetings of the alumni, and including the record of a few who died previously, hitherto unreported, p 396-397. May Sargent was born on 15 Apr 1866, in New Haven, Connecticut. May Sargent died on 4 Mar 1937 in New Haven, Connecticut, at age 70. [S6] Zeigler Sargent, Sargentrivia (privately published), A family newspaper, Vol 4 No 7, May 1946. [S285] 1930 US Federal Census, New Haven, New Haven County, Connecticut, digital image Ancestry.com ; National Archives micropublication, William Acker Rice head of household, roll 276, enumeration district 48, page 2A. [S1218] The New York Times, New York City, NY, marriage notice on-line archive, published 14 Sep 1908. [S280] 1910 US Federal Census, New Haven, New Haven County, Connecticut, digital image Ancestry.com ; National Archives micropublication, Wallace B Fenn head of household, Ward 8, Roll T624_139, enumeration district 0407, page 11A. [S289] 1920 US Federal Census, New Haven, New Haven County, Connecticut, digital image Ancestry.com ; National Archives micropublication, Bruce Fenn head of household, Ward 8, roll T625_193, enumeration district 350, page 11A. His wife Elizabeth died on 18 Apr 1904 in New Haven, Connecticut, leaving him a widower at age 47. [S351] 1900 US Federal Census, New Haven, New Haven County, Connecticut, digital image Ancestry.com ; National Archives micropublication, William H Moseley head of household, Roll 144, enumeration district 341, page 5A. [S2281] Yale University Class of 1910, History of the Class of 1910, Yale College (Volume 1), viewed Jul 2011. Margaret Sargent was born on 15 Sep 1870, in New Haven, Connecticut. 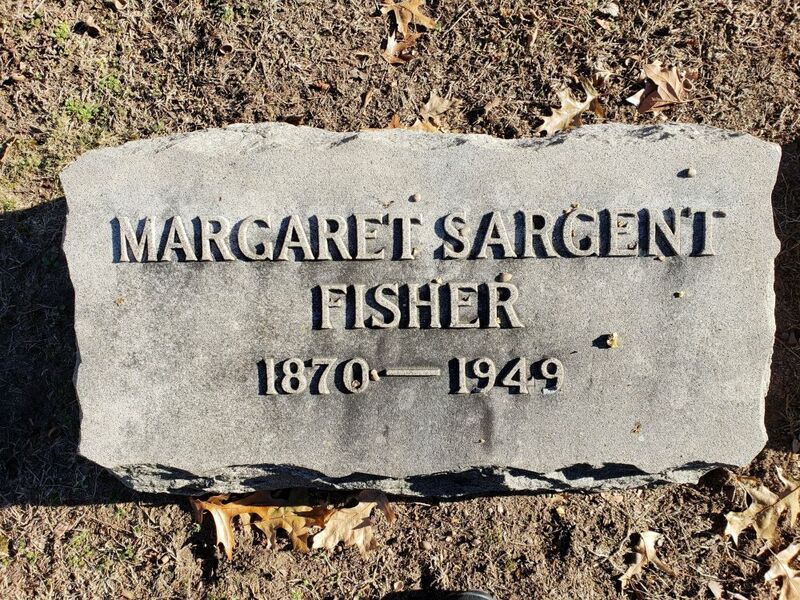 She married Samuel Herbert Fisher on Thursday, 18 Apr 1895 in New Haven, Connecticut. [S1099] US Passport application 1795-1925 Online database www.ancestry.com , Ancestry.com. U.S. Passport Applications, 1795-1925 [database on-line]. Provo, UT, USA: Ancestry.com Operations, Inc., 2007. Original data: Passport Applications, January 2, 1906-March 31, 1925; (National Archives Microfilm Publication M1490, 2740 rolls); General Records of the Department of State, Record Group 59; National Archives, Washington, D.C.
[S5349] Find A Grave: Grove Street Cemetery, New Haven, Connecticut, Margaret Sargent Fisher, created by Sandra Markham, added Dec 2018, memorial number 195451370. [S1523] Margie Sullivan "Descendants of Anne Hoyt", Journal Report given to Linda Sargent Reinfeld, dated 22 Dec 2014. [S1143] Yale University, Directory of the Living Non-Graduates of Yale University: Issue of 1914, Yale University, 1914, p 166. [S389] 1930 US Federal Census, Greenwich, Fairfield County, Connecticut, digital image Ancestry.com ; National Archives micropublication, John Sargent head of household, roll 257, enumeration district 132, page 37A. [S29] Aaron Sargent, Sargent Genealogy in England and America, Somerville, MA: privately published, 1895, p 171. [S377] 1910 US Federal Census, Brookline, Norfolk County, Massachusetts, digital image Ancestry.com ; National Archives micropublication, Rossell S Fenn head of household, roll T624_608, enumeration district 1090, page 1B. [S29] Aaron Sargent, Sargent Genealogy in England and America, Somerville, MA: privately published, 1895, Supplement. [S221] Massachusetts Vital Records 1841-1910, Internet database, online image database, digitized by NEHGS, 2004 www.newenglandancestors.org . (Original publication: NEHGS.) Vol 584 p 18. [S47] 1930 US Federal Census, Hamden, New Haven County, Connecticut, digital image Ancestry.com ; National Archives micropublication, Russell S Fenn head of household, roll 273, enumeration district 0140, page 20A. Harriet Amelia Oaks was born on 27 May 1854. She died on 4 Jan 1942 at age 87. Long Interested in Historical Matters - Funeral Rites Private. 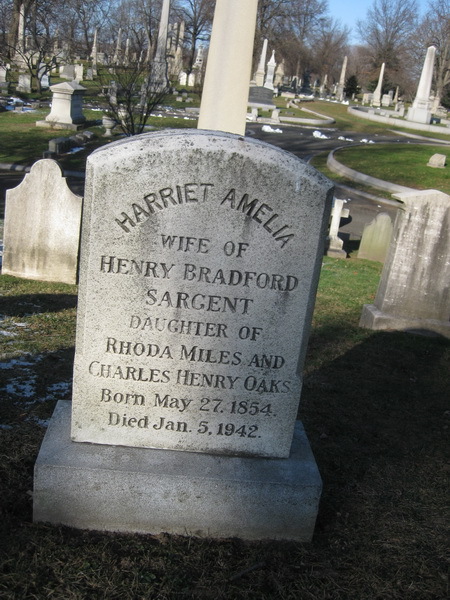 Mrs. Harriet Amelia (Oaks) Sargent, widow of Henry Bradford Sargent, who died in 1927, died yesterday in her 88th year. For the last three years she lived with her daughter, Miss Elizabeth Collier Sargent, at 313 St. Ronan Street. Funeral rites will be private. Mrs. Sargent was interested in historical matters, was one of the founders of the Mary Clap Wooster chapter of the Daughters of the American Revolution and an active member of the Connecticut society of colonial Dames. She was a member of the Fortnightly. She was interested in many charities, and through her family had a wide acquaintance among Yale men and was a keen follower of the university's affairs. 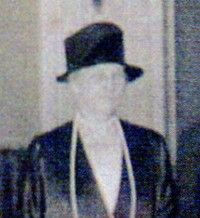 Her husband was treaturer of the Yale Field Corporation for 20 years, followed by 18 years as an elected alumni fellow of the university. In his later years they took several Summer trips to Europe with their daughter Elizabeth, and after his death she spent many summers motoring in England with her daughter, until affairs abroad prevented it. Ms. Sargent was born in New York City May 27, 1854, the youngest of three children of Charles Henry Oaks of this city, and his third wife Rhoda. Her great-grandfather, Nathan Oakes was the first of the family to settle in this city. He was one of the 58 members of the Second Company, Governor's foot Guard, formed marcy 2, 1775, which marched to Boston under Capt. Benedict Arnold after his historic demand for the keys to the powder house here. Mrs. Sargent spent her first five years at her widowed father's home, and then went to live with her aunt Amelia, wife of Rev. 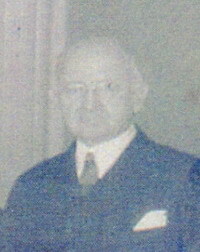 George E. Day, later dean of the Yale Divinity school. They were residing in Walnut Hills, near cincinnati, Ohio, at the time. One of her early recllections was of being in cincinnati during the civil War and seeing President Lincoln drive by. The Days moved to this city in 1870, when Mr. Day was appointed to the holmes professorship of the hebrew language and literature at the Yale Divinity school. He was dean from 1888 to 1895. 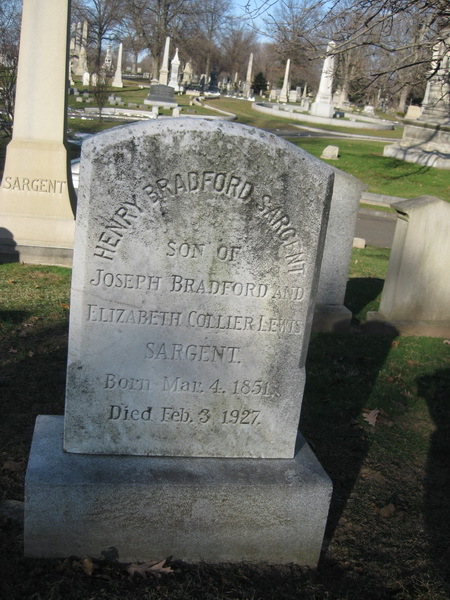 Through her brother she met Henry Bradford Sargent, the eldest son of Joseph B. Sargent, who moved to New Haven when the Sargent & Co. factory moved here in 1864. They were married in her uncle's house Dec 4, 1879. They lived in the old Bacon house at 247 church treet which they later purchased and where she lived until 1938. 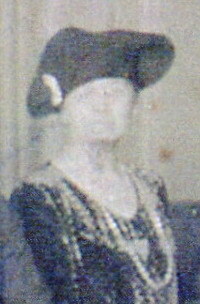 She had five children, Elizabeth Collier Sargent, unmarried, who retired a few years ago from the staff of the Ethel Walker School of Simsbury, and has since been living with her mother; Ziegler Sargent, who is vice-president and treasurer of Sargent & co.; Rhoda Miles Sargent, the widow of Robert F. Tilney, proprietor of the Pettibone Tavern, Westogue, and who has two married children, Bradford S. Tilney of Cheshire and Sylvia, M., the wife of Henry H. Skerrett, Jr., of Weatogue; Murray Sargent, who has four sons, Murray, Jr., (married and father of Murray 3d) James C., Henry B. and John M.; and Bradford Sargent, who died in boyood.